Isiah Thomas and Jaylen Brown seem an unlikely pairing. Thomas was a vital part of the late-80's/early 90's Pistons team that was a major rival of the Boston Celtics. That Detroit team also featured the much-hated Bill Laimbeer. Former Celtic, Robert Parish - normally mild-mannered, had enough of Bill during one contest and punched him to the floor. The brief video can be found below. To be honest, I am not a big fan of Isiah's NBA TV analysis, and my life experience has taught me to be wary of people who smile constantly while talking - but I digress. I was, and am, a huge fan of Thomas' talent and performance on the court. His handle was one of the best I ever witnessed, and his clutch scoring was legendary. He had it all. Hit from outside - drive and finish - pass off. Like Kyrie Irving, his dribbling drove opponents crazy. As detailed on these pages since around the time of the 2016 draft, Brown and Thomas became close through their ties to Cal (Brown went there for a year; Thomas got his master’s degree from the school). The two have since worked to develop Brown as a basketball player and more. In terms of the former, Thomas was extremely impressed with the strides Brown took as he moved into the starting lineup and averaged 14.5 points (18.0 in the playoffs) in his sophomore NBA campaign. Thomas sees Brown as an All-Star if he can get his free throw shooting in the high-70's or low-80's, percentage-wise. 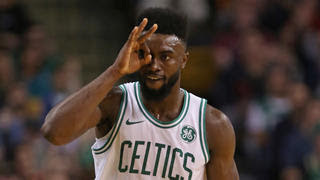 Jaylen certainly is being tutored by a player with superior basketball skills that translated into tremendous success in the NBA. If Isiah's work with Jaylen pays off in his overall performance, I can just see Thomas smiling. He never stops.